White butter cut-out cookies are tasty -- they contain real butter and whipping cream! 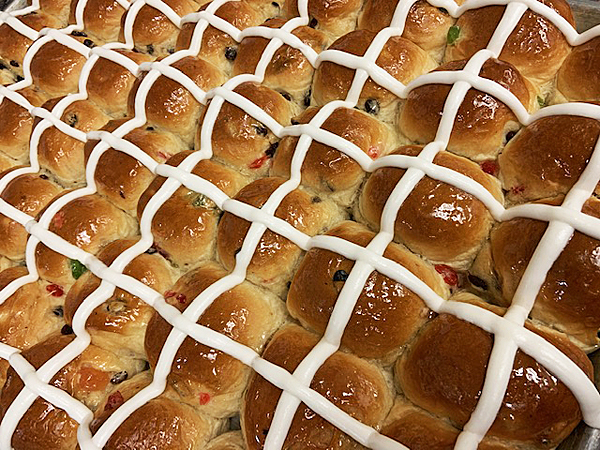 -- and are available in a variety of fun shapes -- bunnies, eggs, chicks and crosses. 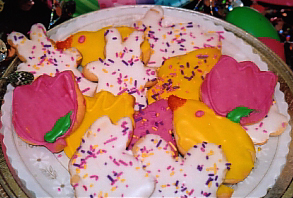 They are then decorated in a wide assortment of Easter colors. Small egg cakes, see photo above, come in chocolate or white and your choice of chocolate or white icing poured over the top and topped with a rose bud. They can be personalized with your children's names or they can be used as place settings for all your guests. To provide variety to your Easter meal -- fruit, melon salad, salmon ball, cheese spread -- add a few Emily's Party Trays to your dinner table. But don't procrastinate. Time is flying. Emily's mouth-watering pies are made from scratch, using time-tested recipes and the finest ingredients. Easter dinner would not be complete without at least one generous slice. Pick out your favorites from the list below. Emily's features numerous fruit and creamcheese coffeecake combinations. They are available in apple, apricot, blueberry, cherry, lemon, raspberry and strawberry. 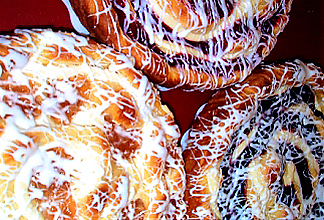 Danish Coffeecakes without creamcheese are available in all fruits, plus almond, buttercream, cinnamon, apple with maple frosting, date, poppyseed and prune. 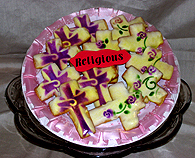 Decorate your Easter table with our beautifully decorated cross-shaped white butter cutout cookies. If you're looking for a special ending to your Easter feast, treat your guests to a slice of Emily's homemade cheese cake. To read more, click here. 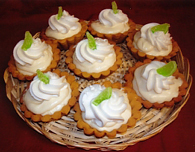 Available in regular size (pictured above) or in a mini-tart size.